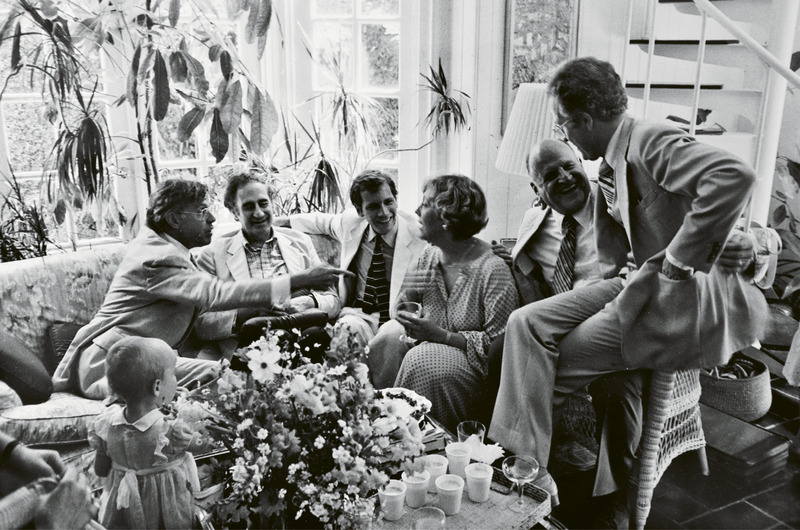 GARDEN PARTY: Ever the hostess, Patti entertains (from left) Charles Wadsworth, Gian Carlo Menotti, Jim Kearney, Ted Stern, and Scott Nickrenz in the McGee family sunroom overlooking the garden, after a Spoleto Festival USA chamber music concert in 1979. MORE DIRT: In the 1990s, Patti got her wish for more “dirt” and garden space when she and Peter moved to Ansonborough, just in time to host her daughter Evie’s wedding reception. 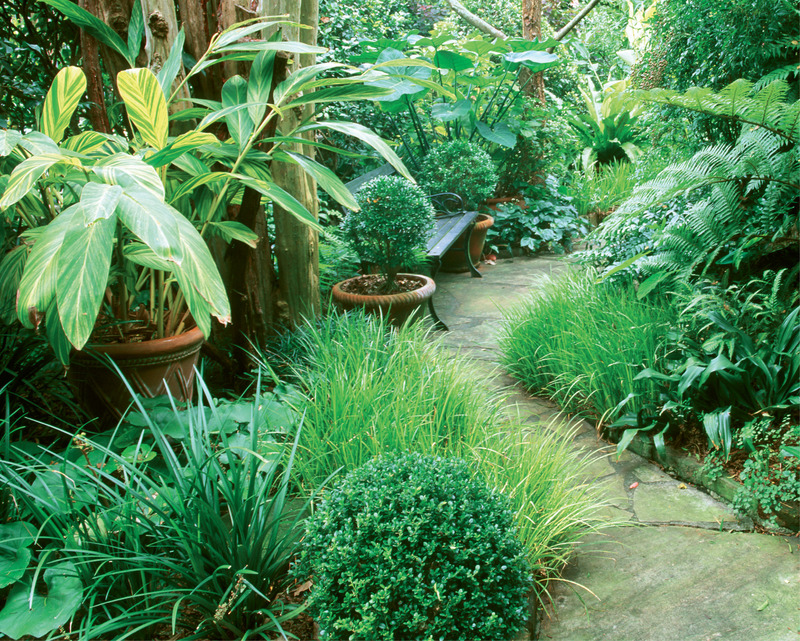 ROOMS TO GO: Patti’s Ansonborough garden, as photographed by Virginia Weiler for the September/October 2003 issue of Horticulture, featured three garden “rooms,” two ponds, and bordered beds planted for interest every month of the year. 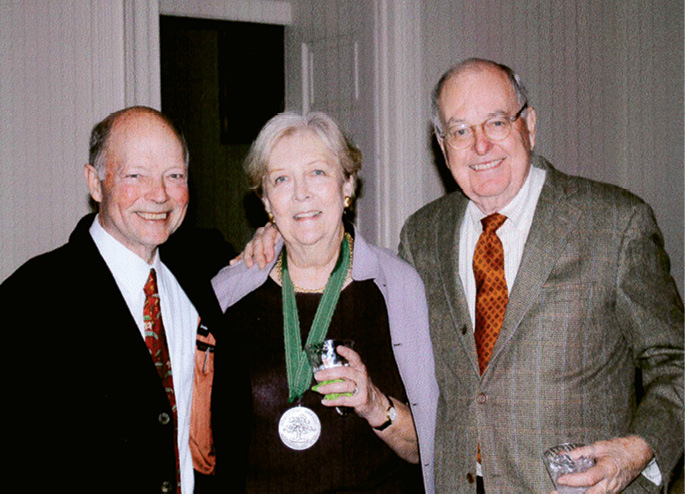 FOUNDER’S FAME: In 2009, Charleston Horticultural Society honored its cofounder Patti (pictured with Edward Crawford and Peter) with its esteemed 1830 Award. 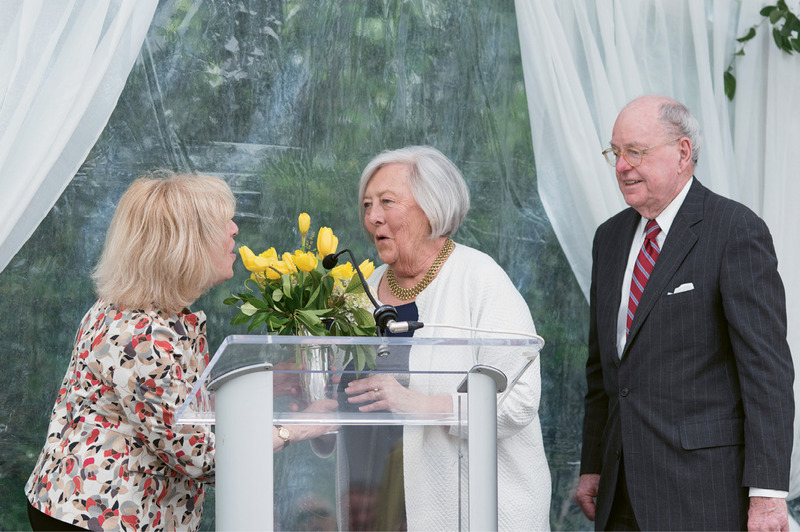 Last April, renowned flutist and Spoleto Festival Chamber Music alum Paula Robison presented the Mary Ramsay Civic Award to Peter and Patti. 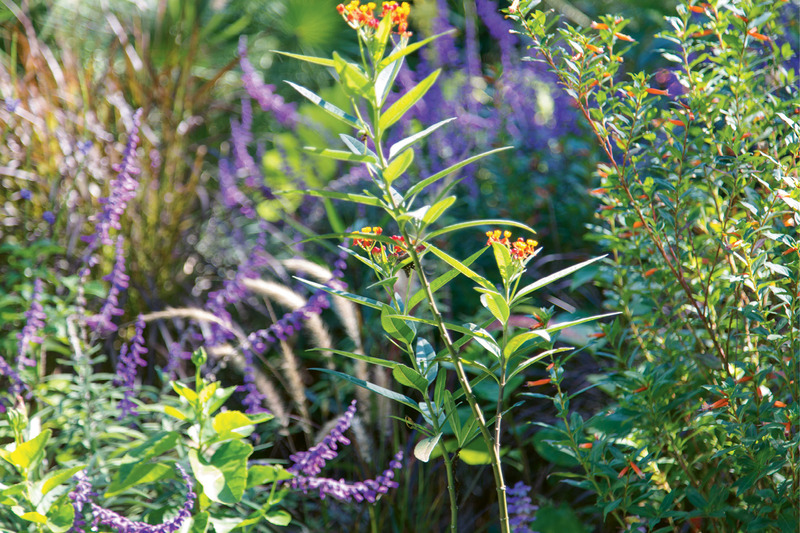 BEACH BABY: Though still an infant by garden standards, Patti’s Sullivan’s Island garden was featured during the Charleston Horticultural Society’s Fall 2017 Garden Tour; (below) the complementary colors and textures of butterfly weed and Mexican bush sage. Many of these will be available for sale at Plantasia, the Charleston Horticultural Society’s annual gardening extravaganza, on April 13 (Friday evening party) and April 14, from 8 a.m. to 3 p.m. at Old Towne Creek County Park. For tickets and more information, visit www.chashortsoc.org. PHOTO: Patti McGee among the Mexican bush sage, butterfly weed, and Alpinia in her Ansonborough garden in 2003; photograph by Virginia Weiler. It’s gray and gloomy on the winter day I visit famed gardener Evelyn “Patti” McGee, and I’m oddly consoled to find her Sullivan’s Island yard looking about as drab and frost-defeated as mine. But as quick as weeds sprout, it becomes clear what makes her an accomplished green thumb and me, well, not so much. Where I, and perhaps many of us, see bare stalks and shriveled shrubs, McGee sees verdant potential. What to me looks like hours of dismal, daunting chores to her looks like fascinating creative opportunity. She’s unfazed by setbacks, like January’s crazy snowfall or inundation from hurricanes and floods. Her iris-blue eyes light up as she talks about the clivia that will come back and explode in color, and the yucca that punctuates with texture and interest over by the gate. For McGee, the garden is a love song to beauty, possibility, creativity, and learning. What has made her the grand dame of Charleston gardeners isn’t her ability to rattle off Latin botanical names (which, she admits, has never been a forte) or even her tireless leadership in everything from the Lowcountry Garden Club to the Charleston Horticultural Society to the national Garden Conservancy. It’s the fact that she was the consummate hostess first, and gardener second. She creates a garden as if she were hosting a party, and a plant is like any guest lucky enough to venture into Patti McGee’s lair: she’s genuinely interested in it; it’s warmly welcomed, fed, and watered; she gives care and attention to helping it feel comfortable and thrive. After spending just a little time hearing about her decades-long dig into the horticultural arts, I begin to realize it’s not so much that she’s got a green thumb as a big heart. Flashback to 1977, when Spoleto Festival USA was just a wee seedling and the McGees—Patti and husband Peter, daughters Evelyn (“Evie”) and Madeleine—lived directly beside the Dock Street Theatre. “We had a tiny garden courtyard with a lovely ‘Lady Banks’ rose, but very little else that was not old brick,” says McGee, who grew up in Marion, South Carolina, where her mother was an accomplished and enthusiastic gardener. 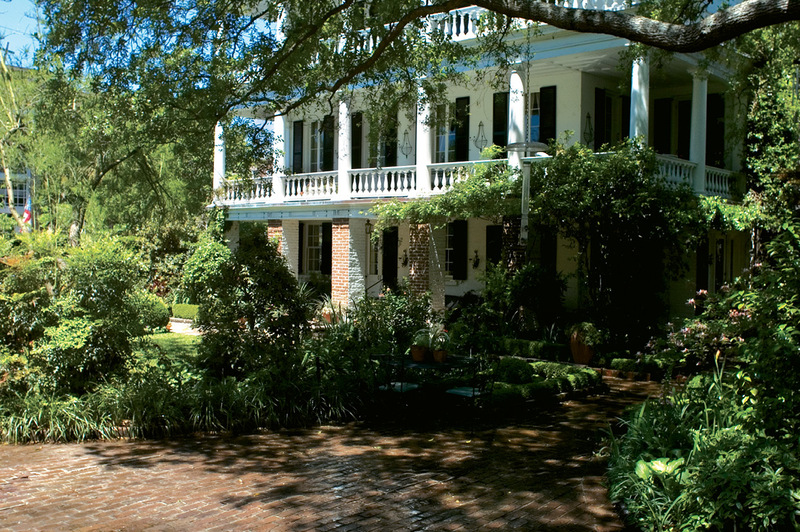 Yet acreage proved irrelevant when coupled with McGee’s expansive spirit of hospitality; the family opened their cozy garden and home to Spoleto musicians after chamber music concerts. “Serendipity,” demurs McGee, “we simply had a convenient courtyard.” But those who were fêted there over the 16 years that the McGees lived on Church Street—YoYo Ma, Joshua Bell, Paula Robison, Scott Nickrenz, and Charles Wadsworth among them—would beg to differ. The family’s warm, festive welcome made the after-parties as much a draw to the artists and guests as the concerts themselves, and one of the reasons the Chamber Music series became an anchor for the festival’s overall success. 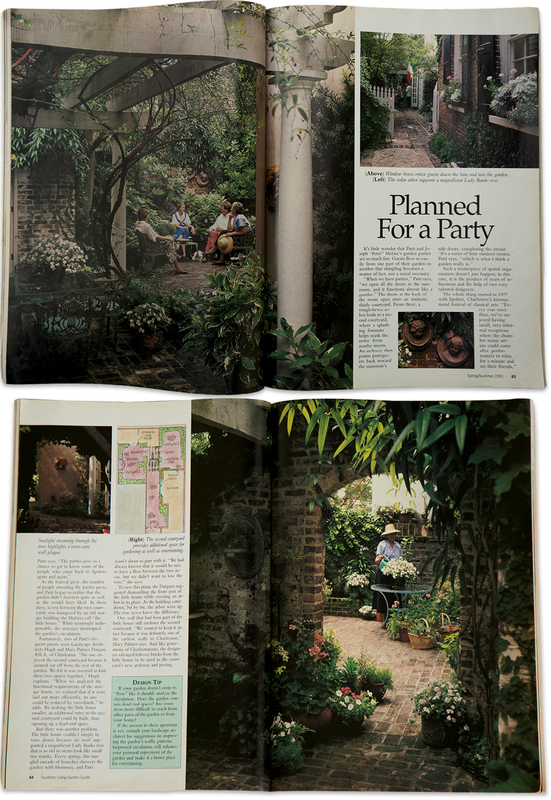 McGee’s frequent entertaining for Spoleto and other events also helped deepen her interest in enhancing her backyard space. 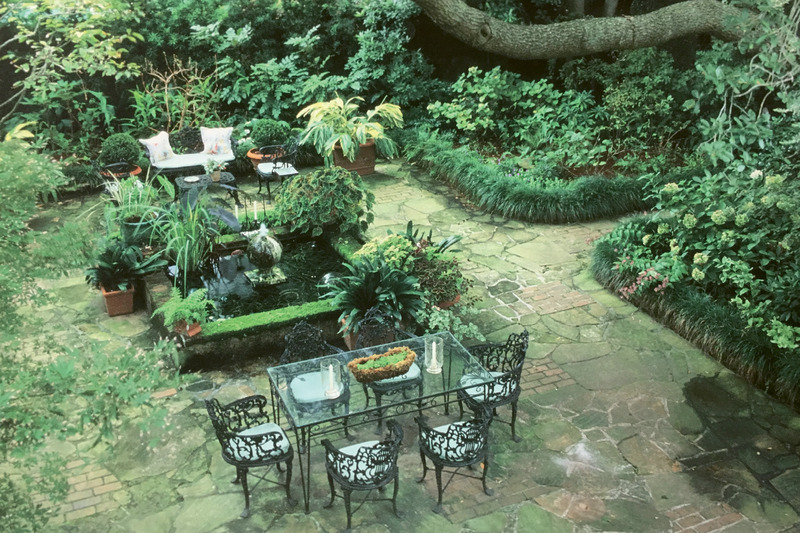 “I enjoyed our courtyard, but I never considered it a garden,” says McGee, who, in the mid-1980s, hired Mary Palmer and Hugh Dargen, Charleston’s go-to landscape experts at the time. At the pros’ recommendation, the McGees added a new arch and opened up a bit more room by reducing the size of an outbuilding. “It gave me some space, and I had a lovely little water fountain, but I still didn’t have much dirt,” McGee says, so she compensated by adding containers. “Lots of them,” she laughs. 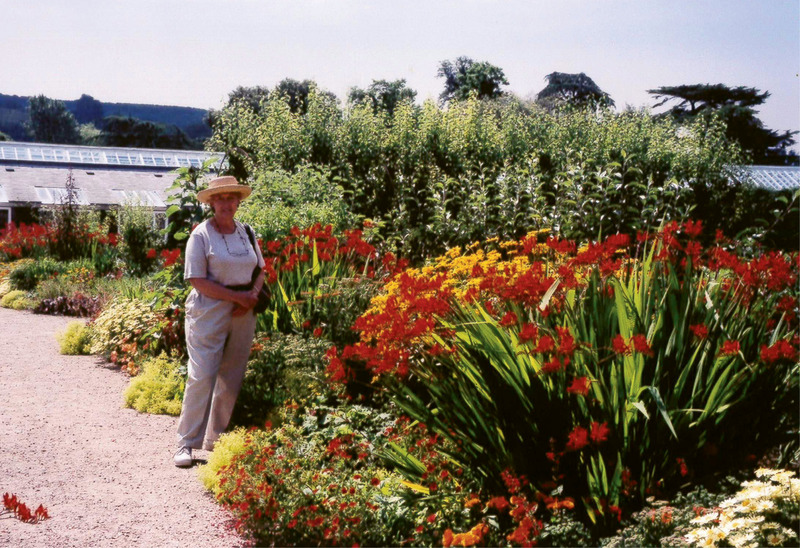 The 1990s was a fertile decade for those interested in gardening, according to McGee, whose passion for it was beginning to bloom. A more diverse array of plants was becoming available, as was more information about them. “The White Flower Farm catalog was my main education source when I was first starting,” says McGee, who today boasts a library full of dog-eared tomes, some of which feature her own gardens. To satisfy her growing interest in learning about plants, she and a few others founded the Lowcountry Garden Club, which was more geared to education than to socializing, and before long McGee got a phone call from a friend in Columbia asking if her new club would host Penelope Hobhouse, who wanted to visit Charleston. “I said, ‘Sure, we always like meeting new people, but who’s Penelope Hobhouse?’” McGee recalls. Turns out Hobhouse, honored with an Order of the British Empire for her contributions to gardening, was (and is) one of Britain’s preeminent garden writers and designers; but for McGee, the real bonus was that another expert horticulturist, Mary Crain Penniman, escorted her to Charleston. Penniman, who had apprenticed at the Royal Horticultural Society and was then working at Georgia’s Callaway Gardens, was charmed both by McGee and her little courtyard, and the two began a long friendship. “We just hit it off,” notes McGee, who credits Penniman for encouraging her to learn the Latin botanical names to properly distinguish among the many varietals. “One thing she said really stuck with me: ‘You have a wonderful courtyard,’ she told me, ‘but you can do a lot more than grow ivy and camellias. A garden is only as interesting as what you put in it,’” McGee recalls. An eager student, McGee dug in and dutifully studied Latin nomenclature. “I also learned how to put plants together so they had a happy relationship texture-wise,” she says. Eventually she outgrew her sweet, small courtyard, and the McGees moved to Anson Street, mostly “because I wanted more dirt,” she admits. Dirt she got—nearly a quarter acre of it, along with the bones of a Loutrel Briggs garden that she revitalized and made her own, experimenting with different varietals, layering foliage, creating borders and structures, and introducing rock gardens and succulents. “After taking the Church Street courtyard as far as it could go, Patti began looking at a garden holistically at Anson Street—the architecture of it,” says Penniman. She pruned tightly, played loosely, and rearranged things to no end. “Patti absolutely loves plants, especially the new and different, and she’s fearless when it comes to moving them around in her garden. 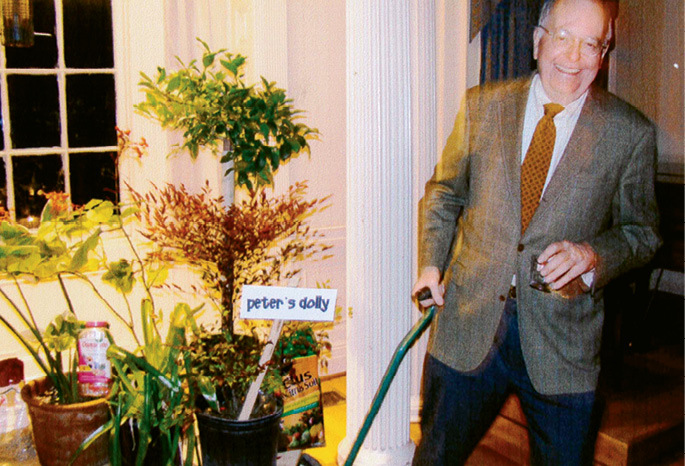 I tease her that each plant was planted with its own little wheelbarrow under the soil for ease of future placement,” says Charleston landscape architect and McGee’s longtime friend and occasional consultant, Sheila Wertimer. Throughout it all, McGee was voraciously learning. On annual trips to Manhattan for Spoleto board meetings, she would steal away to the New York Botanical Gardens—proudly “getting my Southern self all the way there on the northbound Metro,” she laughs—to attend symposia by luminaries like Marco Polo Stufano, who sparked her interest in designing with texture. 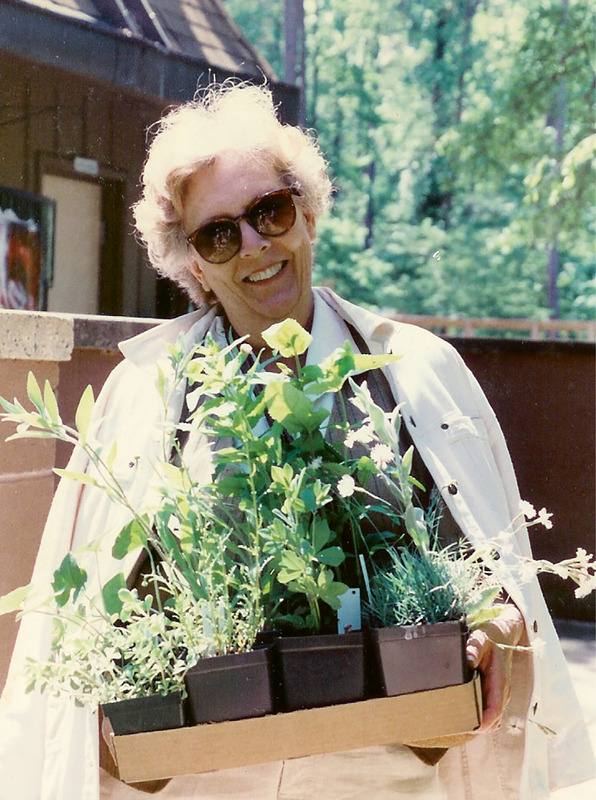 In 1989, she got a phone call from Frank Cabot, the most iconic of American gardeners, inviting her to attend an advisory meeting of a nascent national garden conservatory group at Winterthur. The meeting was in June, which meant missing Spoleto events for the first time ever, but McGee eagerly went. 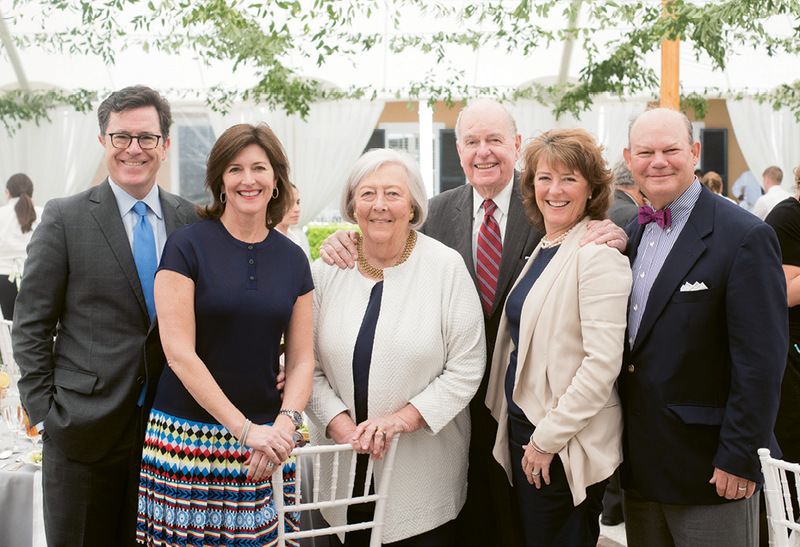 McGee became an active advisory committee member, helping Cabot shape the mission and programs for the new organization, and in 1991 she joined the Board of Directors of the Garden Conservancy, whose mission is saving and sharing America’s outstanding gardens to inspire and educate the public. 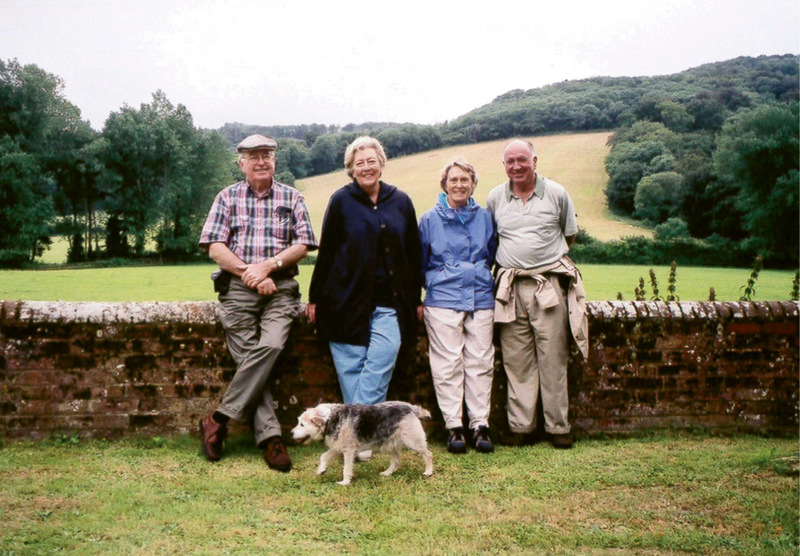 Through her work with the Conservancy, Patti and Peter traveled extensively to visit the top gardens and gardeners nationally and internationally, and she brought her knowledge and her connections—as well as “cuttings, always new plants!” she says—back home to share. Upon retiring from the Conservancy board in 2015, McGee was honored as a Director Emerita, with a resolution noting her “extensive knowledge of the history of American gardens and her passionate conviction of their importance,” as well as the integral role she played in preserving significant Southern gardens, including those of Elizabeth Lawrence in Charlotte and Pearl Fryar in Bishopville. Closer to home, the Charleston Horticultural Society—which she helped establish in 2000—honored her in 2009 with its 1830 Award, recognizing “exemplary horticultural service and creative vision in the Lowcountry.” And in 2012, the Garden Club of America acknowledged McGee as an Honorary Member for her work in advancing horticulture. Despite national and local accolades, Patti McGee’s greatest and most enduring satisfaction comes from getting her hands dirty and from the relationships that stem from gardening, including her 20-year friendship and collaboration with Beverly Rivers, her right hand in the garden. Rivers and fellow helper Beth McGinty have been assisting McGee in her most recent challenge: shifting from an established downtown Charleston garden to one on Sullivan’s Island, where the McGees moved three years ago to be closer to their children and grandchildren. 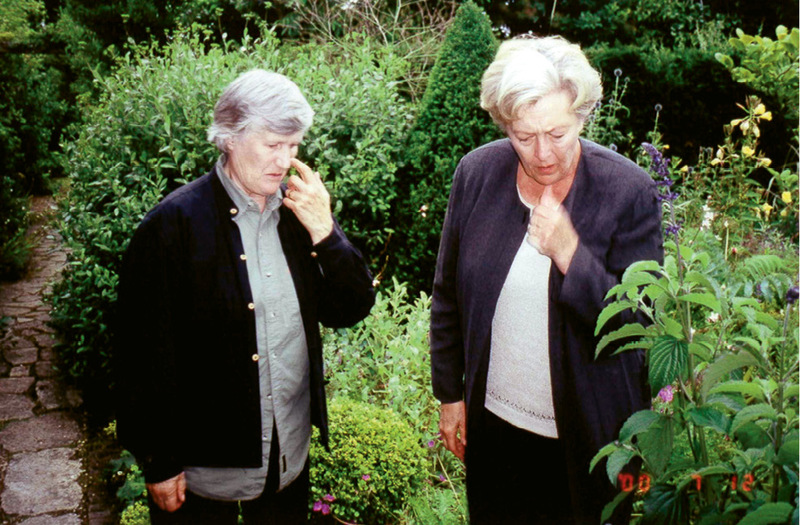 When reflecting on the many significant events in her long gardening career, McGee comes back to one “aha” moment: when Mary Crain Penniman had come to visit and was on a ladder, helping prune a creeping fig on the Church Street courtyard wall. “I’d always just cut it back, but I watched Mary Crain carefully take each vine and untangle it to prune it just so,” she says. 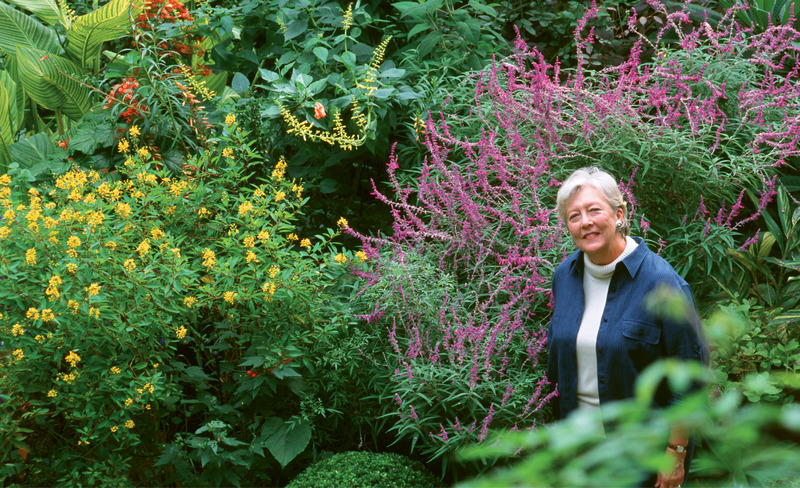 That’s the level of attention and care that McGee learned to embrace in her gardens, and this love of caring for and studying plants became fully entwined with her other passions—for family, for entertaining, for community. Her gardens are where these loves have all come together, spaces made inviting by layers of sensory delight, from the exuberant orange of her beloved clivia to sweet fragrances of jasmine and contrasting textures of hellebores and farfugium. “Soft spaces, with a real sense of romance and quality,” as McGee describes the quintessential Southern garden; spaces as welcoming to birds and butterflies as they are to her grandchildren or to internationally celebrated musicians and artists or to tourists passing by. Patti McGee is a plant lover through and through, so picking favorites is a bit like singling out a most adored child—hard to do, and even if you could, you wouldn’t admit it. 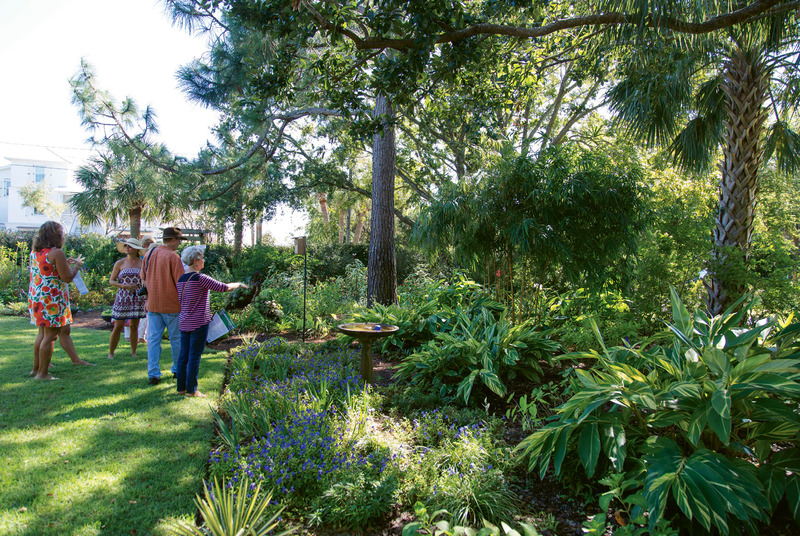 But she also loves sharing her plant passion with others, so in the spirit of spreading the joy, here’s a dozen of her go-tos for a Southern garden, including plants that can thrive in a beach garden. Many of these will be available for sale at Plantasia, the Charleston Horticultural Society’s annual gardening extravaganza, on April 13 (Friday evening party) and April 14, from 8 a.m. to 3 p.m. at Old Towne Creek County Park. For tickets and more information, visit https://chashortsoc.org/.